The common mallow is a pretty little, low growing weed that will flower and spread seeds all summer long. The flowers of the common mallow are very tiny, white and funnel-shaped. Other mallows have larger, pink to purple flowers. The fruit of the common mallow looks like a flattened button with 10-12 wedge-shaped seeds. It has been described as looking like a tiny wheel of cheese which gave it the nickname of cheeseweed or cheeseplant. Mallow seeds have a low germination rate, but they can remain in the soil for decades and still be viable. 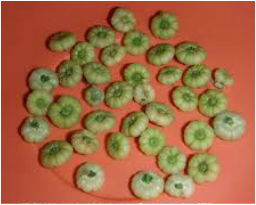 Mallow is sometimes a host for insect pests like whiteflies and thrips and viruses like alfalfa mosaic virus, cotton leaf crumple virus, tomato yellow leaf curl, and tomato spotted wilt virus. Whiteflies and thrips carry the diseases to surrounding crops. 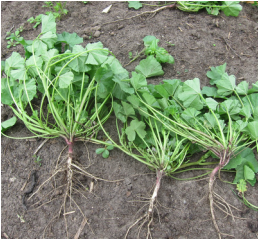 If there are a lot of mallow plants in a field crop yields will be reduced. They can also make harvesting crops difficult by tangling in the machinery. The best defense against a mallow infestation in a yard is to have a healthy lawn where seeds are not able to get into the soil and germinate. 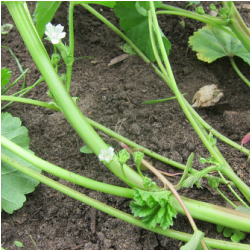 If you do see little mallow weeds in your yard or garden pull them while they are small because they will quickly develop a thick, sturdy taproot that is difficult to pull. Cutting them off is not effective unless you cut them off at the crown because cut plants will continue to grow, spreading low to the ground. Even cutting them off at the crown is not effective for older plants because they will resprout from the crown. Years ago my neighbor took a trip out east and brought me a package of mallow seeds from Monticello. Thomas Jefferson referred to a “French Mallow” in his notes on cultivated flowers. The flowers she brought me were more like a small hollyhocks than the low growing common mallow weed. ​Like many weeds, the mallow has been used medicinally in the past in many different ways. Also, like many other weeds, mallow is also edible. (Insects and caterpillars love them!) As far as for humans, mallow leaves, stems and immature seeds can be eaten raw or cooked and are actually quite nutritious. The thick taproots can be boiled then fried with onions and butter. The ancient Romans considered the mallow a delicacy, but in other areas such as Syria it was just considered a common food for the poor. The ancient Egyptians used the sap from a cousin of the common mallow, Althaea oofficinalis to make a sweet treat with honey. This was the origin of what we know as marshmallows without which s’mores and Rice Krispie bars would not exist. And that would be a shame. ​French candy makers improved on the Egyptian recipe in the early 19th century when they began whipping the marshmallow sap. The French candy looked more like the modern marshmallow than what the Egyptians made. It was a popular treat, but whipping the sap in the days before electric mixers was extremely labor intensive and eventually the sap was replaced by egg whites or gelatin. Mix sugar, corn syrup, salt, and ¾ cup water in a medium saucepan and bring it to a boil over high heat, stirring to dissolve the sugar. Cook without stirring until mixture registers 238° on a candy thermometer. Meanwhile, put ¾ cup cold water into the bowl of an electric mixer and sprinkle with gelatin. Let it soften for five minutes. With mixer on low speed, whisk hot syrup into gelatin mixture. Gradually raise speed to high and beat until mixture is very stiff, about 12 minutes. Beat in vanilla. Pour into a 9 x 13 inch glass baking dish lined with parchment paper brushed with oil. Smooth the top of the marshmallows. Set aside, uncovered, until firm, about 3 hours. ​Sift 1 cup powdered sugar onto a work surface. Flip over the dish of the molded marshmallow onto a work surface covered with powdered sugar and peel off parchment paper. Lightly brush a sharp knife with oil and cut marshmallow into squares. Roll each marshmallow square in the powdered sugar to coat so that they do not stick together. ​One thing I learned while researching the mallow is that there is a real marsh mallow. It’s a plant in this family that grows in a swampy area. Another thing I learned is that the Stay Puft Marshmallow company as well as the Stay Puft Marshmallow man were just a fictional invention for the movie, Ghostbusters. I thought it was an actual marshmallow company. It's very confusing because I saw the Stay Puft Marshmallow man on a display in Walmart just today. But now I know this rather useless bit of trivia. Pull common mallow as a weed. Plant French mallow as a pretty addition to your landscape. Make Rice Krispie Bars with marshmallows.